The websites Plataforma Arquitectura and ArchDaily have played a fundamental and pioneering role in disseminating the ideas and work of Latin American architectural collectives. The story of their creators, David Basulto and David Assael, whom we interviewed through e-mail, deserves a space of its own. Plataforma Arquitectura and ArchDaily (the most clicked architecture web page on the planet), based in Santiago, Chile, have played a crucial role in making Latin American architecture collectives and emerging Latin American architecture visible in global architectural culture. These young Chilean architects had initially launched the web-site Plataforma Urbana (Urban Platform) in 2005, propelled by, in Basulto’s words, “the simple idea of improving the quality of life in cities through information. Information is power, and with the emergence of blogs we recognized an opportunity to disseminate urban themes to citizens who were not being informed” on issues related to planning. Plataforma Urbana is the digital embodiment of a physical space: In a blog, Assael describes a visit to Barcelona, where he came across the exhibit, Metròpolis Barcelona: The Common Project . In it, citizens were informed, through sundry media (including a large-scale map on which they could walk and locate their homes and businesses), about projects planned for the city. They could understand how these were to affect their neighborhoods and daily lives, and they could participate in decision-making. The immediate success of Plataforma Urbana, which attracted a broad audience of city dwellers, municipal authorities, and government leaders, led Assael and Basulto to launch, three months later, Plataforma Arquitectura, an online forum tailored to design professionals. 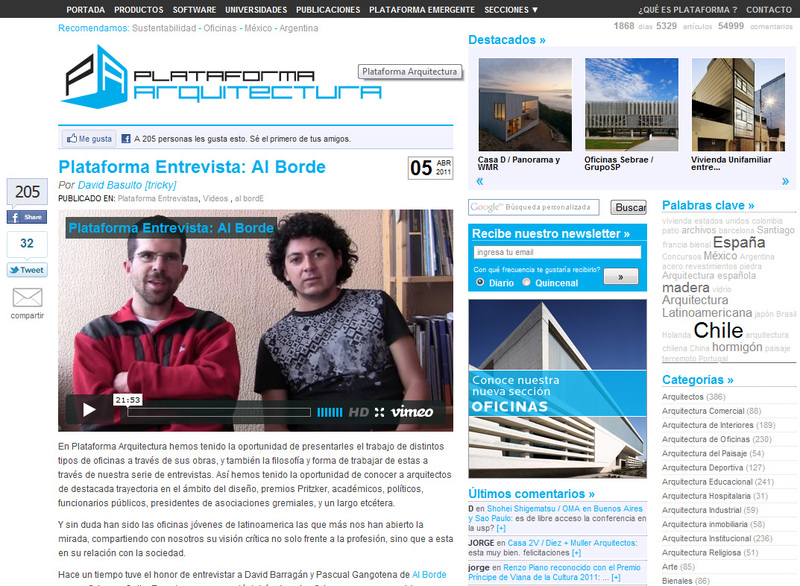 Its interactive blog format allowed visitors to actively engage in conversations: In Basulto’s words, “The architects themselves became the new critics of architecture.” Two years later, Plataforma Arquitectura, a Chilean enterprise born in Santiago, had become, according to Basulto, the most popular architecture website in the Spanish-speaking world . In 2008 Assael and Basulto branched out to New York, where they launched ArchDaily, which soon became the most visited source of information on architecture in the wired world . Plataforma Arquitectura and ArchDaily dared to do something that had almost never been done before: They located the production of Latin American architects (of those based in the region), particularly young practices, in the same space with international emerging and well-established architects. Their move was bold and unexpected. It defied any sort of predefined hierarchy; it questioned traditional curatorial practices; it was not promoted by any established cultural institution, nor did it respond to any interest beyond making Latin American design practices visible. If Latin American architecture had been allotted a separate space in these digital platforms, the message would have been very different and would have offset the opportunities it opened by instead mixing scales, typologies, technologies, and geographies. Intermixing, along with a vast capacity to openly exchange information, was key. These sites have played a role that cannot be underestimated in increasing the self-confidence and presence of Latin American professionals throughout the world. See David Assael, “Barcelona: el Proyecto Común… ¿Y nosotros cómo andamos por casa?” (blog), April 9, 2007, http://www.plataformaurbana.cl/archive/2007/04/09/metropolis-barcelona-un-proyecto-comun-y-como-andamos-por-casa/. David Basulto, e-mail interview with author, December 2010. See David Basulto, “YAMoPo 2009: Yet Another Most Popular Architecture Sites Ranking,” June 9, 2009, http://www.archdaily.com/24023/yamopo-2009-yet-another-most-popular-architecture-sites-ranking/. Assael and Basulto needed to interconnect using a “global node” (New York) as a source, in order to reach beyond the Spanish-speaking world. ArchDaily is certainly much more international than Plataforma Arquitectura, where the emphasis is on Iberian America (former Spanish and Portuguese colonies, Spain and Portugal). But they haven’t neglected the region —quite the contrary.